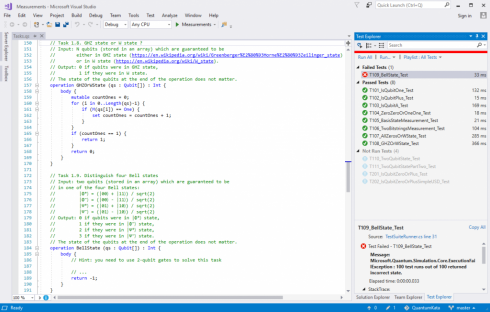 In order to give coders a head-start on quantum computing and learning its Q# programming language for quantum computing, Microsoft has launched the open-source Quantum Katas tutorial project. Basic quantum computing gates. Tasks which focus on main single-qubit and multi-qubit gates used in quantum computing. Superposition. Tasks which focus on preparing a certain superposition state on one or multiple qubits. Measurements. Tasks which focus on distinguishing quantum states using measurements. Deutsch–Jozsa algorithm. Tasks which focus on writing quantum oracles which implement classical functions, and the Bernstein–Vazirani and Deutsch–Jozsa algorithms. The tutorials are available on the project’s GitHub repository, and users will need to install Microsoft’s Quantum Development Kit to get started. This follows Microsoft’s first Q# coding contest earlier this month, which saw over 650 participants worldwide attempt to solve 15 quantum computing problems. Along with the katas, Microsoft says that these competitions are another good way for coders to prepare themselves for quantum computing to come. Next articleCan Fintech Solve The US Healthcare Crisis?